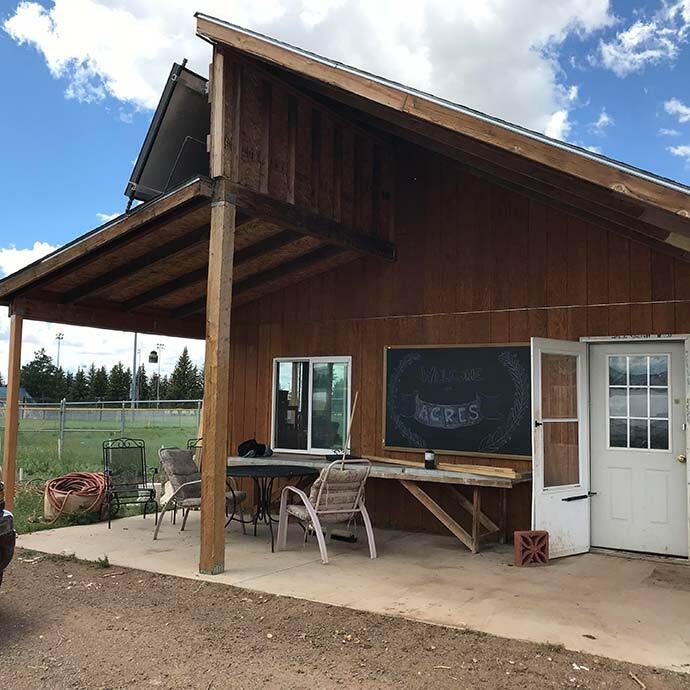 The conception of ACRES began in the fall of 2006, when University of Wyoming Agroecology student Mary Huerter expressed interest in operating a student farm to fulfill internship requirements for her degree. ACRES became a reality after discussing the potential of a student farm with Dr. Rik Smith and several University of Wyoming students from the Department of Agroecology and the Haub School of Environment and Natural Resources. Students applied for several grants, and received approval from Dr. Stephen Miller to farm a 1.8 acre portion of land at the Agricultural Experiment Station. The students and Dr. Smith also designed a seminar course, Student Farm Assessment (PLNT 4790), which was first offered in the spring 2007 semester. PLNT 4790 enrollment was approximately fifteen students and community members from diverse backgrounds. Publicity and support in both the university and community arenas raised awareness of the student farm project, and ACRES received grants and donations from local and national entities. ACRES received $1000 from the School of Environment and Natural Resources for a compost program and the Laramie Rivers Conservation District matched the funds. Ace Hardware and K-Mart donated tools and miscellaneous items and Windmill Hill Nursery donated hundreds of dollars worth of seeds and starter plants. In the spring with the help of the class, the farm site was prepared through minimal tillage and removal of a number of diseased pines. Seeds and starters were planted. In total one-third acre was farmed for onions, lettuce, kale, broccoli, and potatoes. PLNT 4790 was offered again in the fall semester of 2007. ACRES sold all of the remaining produce to the newly-established Big Hollow Food Co-op. Primary activities during the fall focused on the compost program. Officer elections were held during the spring semester of 2008, and the PLNT 4790 seminar was offered again. ACRES continued to expand its composting operation to include a total of nine businesses, and provided composting services for the Earth Day barbeque at the University of Wyoming. ACRES purchased a greenhouse with a $1000 grant from the Wal-Mart Corporation to extend the growing season. A larger cropping plan was developed, requiring a larger quantity and variety of seeds. Once again a majority of the seeds were donated. Fruit trees were purchased with grant funding from the Haub School of Environment and Natural Resources. ACRES hired their first AmeriCorps employee to assist with planting and volunteer recruitment. ACRES rapidly expanded during the busy summer of 2008. The composting operation now included ten stops, and approximately 2,500 gallons of compost were being collected monthly. Student and community members constructed the first high tunnel at the farm, and planted and tended the crops. ACRES also worked on expanding involvement with sustainable agricultural projects in the community and classroom. ACRES started working closely with other recognized student organizations that focus on sustainability issues on campus, specifically ACRES associates with Students for Sustainability and the Student Sustainability Council. ACRES also started assisting programs to encourage children to participate in sustainable agriculture. 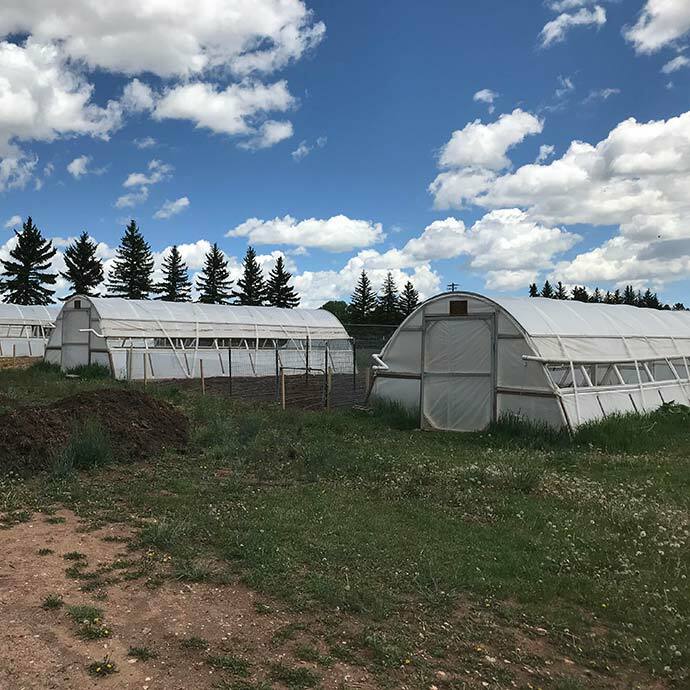 ACRES began working with the Laramie River's Conservation Education Program with their greenhouse and outdoor garden, and with the University of Wyoming Early Care and Education Center to begin composting their food waste and assisting the facility with constructing a gardening program. ACRES continues to participate in community outreach programs such as the Laramie River's Conservation Education Program, and is assisting the University of Wyoming Early Care and Education Center with their garden plans. ACRES has also started presenting information at educational conferences including the Local Foods Movement, Rocky Mountain Sustainability Summit, and Sustainable Business Practices Forum. ACRES continues to focus on composting operations, and it is estimated that 50,000 gallons of compost are being picked up by student and community members annually. The compost is stored and maintained on the farm site, and it is used to cover the fields when the compost cycle has reached completion. ACRES is also in the process of applying for grant funding to purchase a truck/trailer to increase the volume of compost collected and transported to the ACRES farm. ACRES began construction of the energy-efficient storage and harvesting station. By the end of 2010, the base was completely set, complete with pipes to heat the structure using only hot water, which will be heated by a generator. Construction is slated to be finished in the summer of 2011. 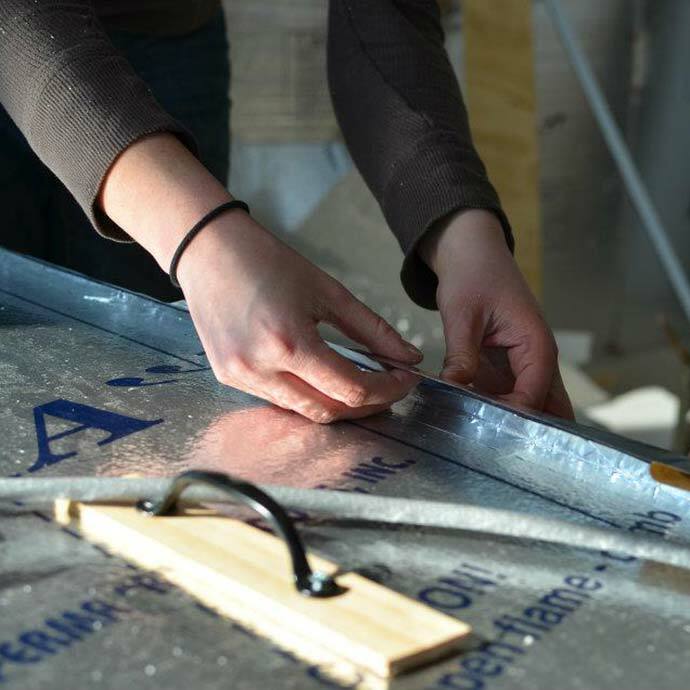 The harvesting station project is being funded by a grant from the Associated Students of the University of Wyoming (ASUW), and it is being designed by faculty and students from the College of Engineering at the UW and LCCC. ACRES started a small CSA (Community Supported Agriculture) program in the summer. Six people bought six full shares of ACRES' produce for 12 weeks, and enjoyed a wide variety of vegetables throughout the season. Near the end of the summer, the variety of produce was less varied, so ACRES has resolved to diversify crops and planting times as much as possible next year. Overall, the program was a success, and will continue in 2011. ACRES continued and expanded the CSA program to include 11 half shares and 3 full shares. A customer satisfaction survey conducted at the end of the season showed a very high satisfaction rate with the CSA program as well as with ACRES in general. ACRES also participated in seven of the 14 Laramie farmers’ markets, expanding the variety of products sold to include bumper stickers, t-shirts and aquaponiclly grown greens and herbs (provided by Nate Storey). 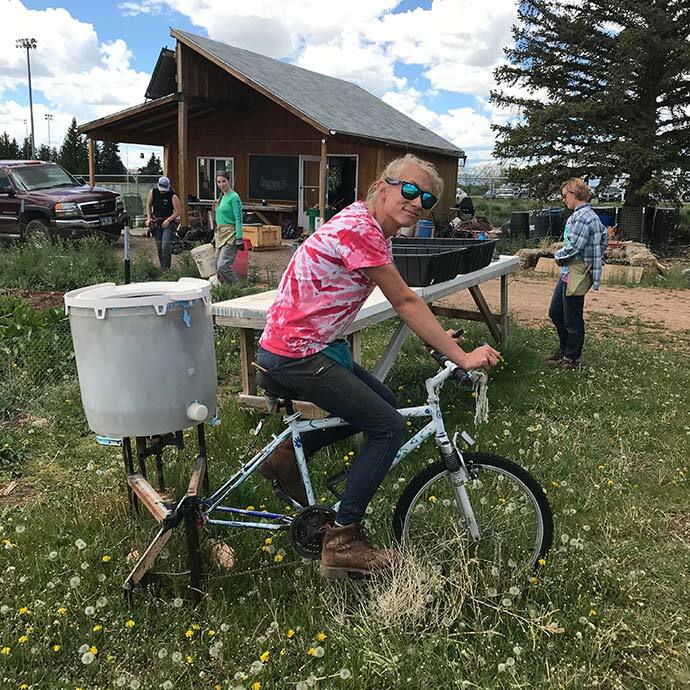 The completion of the bicycle-powered salad spinner not only greatly decreased harvest time, but it also earned ACRES a front page article in the Laramie Boomerang. The solar powered harvest facility was completed in August and the interior was completely insulated in October/November, and will serve as a much needed storage/meeting facility. The farm also expanded in the field of undergraduate research, as Erin Anders conducted research on tomato plants and Daniel Blaney experimented with the intercropping of elm oyster mushrooms with various other plants. Another great benefit came to ACRES in the form of a grant to build 5 high tunnels on the farm property. Each tunnel will have different properties regarding materials and insulation, and they will be monitored by the USDA and studied as models for ideal high tunnels in Wyoming. For the study, each tunnel had different experimental treatments including water-filled barrels (some painted black) and single or double layers of plastic. The study concluded that these different treatments did not make a significant difference in temperature, so the water-filled barrels were removed after the completion of the study. ACRES Student Farm Manager, Sarah Legg, creates the ACRES Handbook. This practical guide seeks to provide institutional knowledge and continuity as the farm changes hands from one group of students/interns to the next. The farm receives the generous donation of a new truck from a former UW faculty member, and their beloved old farm truck, Sam the 1990 Ford Ranger, is retired. The new GMC truck is more reliable (and easy to drive), and it allows the students to continue running their compost-collection program all year round. Wyoming Master Gardener Chris Hilgert begins his work on strawberry production for a 2-3 year Specialty Crop Grant. Chris plants 4 rows of Seascape strawberries in one of the small high tunnels and collected data on harvest yields. The strawberry study was a great success. The study found that the strawberries had maximum yields during year two of growth, and after three years it is recommended that the plants be replaced. 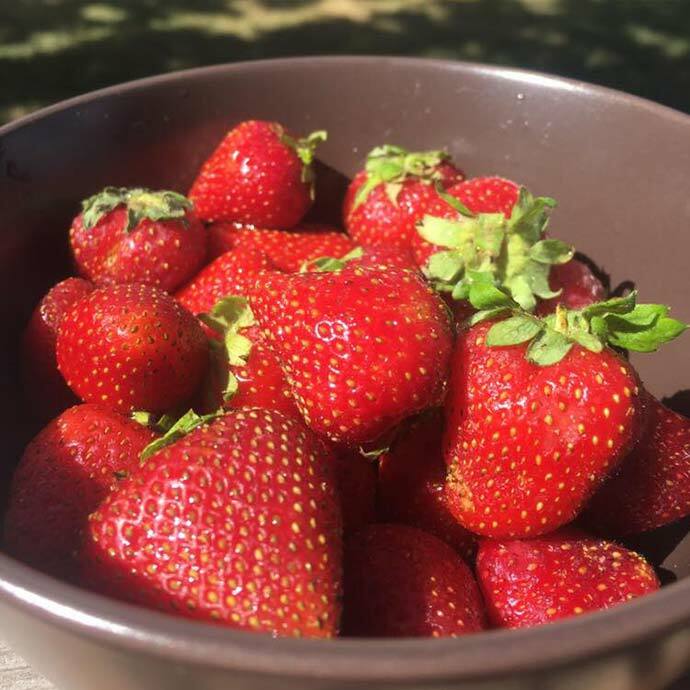 Strawberries quickly became a favorite among CSA members and at the Farmer's Market, so the students will continue to grow strawberries in the high tunnels at ACRES each summer. ACRES switches over from awarding Scholarships to using the University Payroll system for summer interns, allowing UW graduates and other community members to work on the farm. Summer High School Institute begins coming to ACRES regularly as a part of their summer college preparation program for high school students from WY. 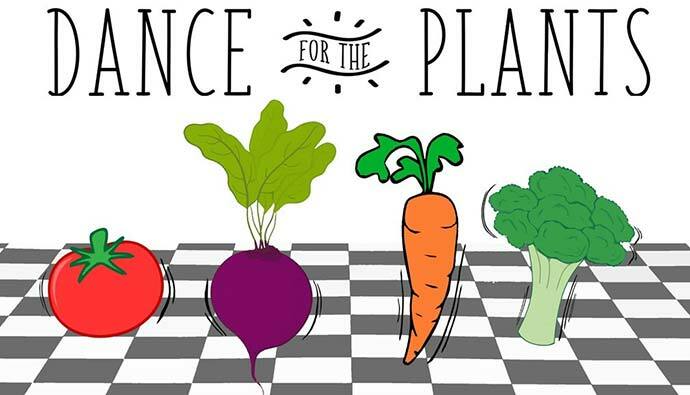 ACRES hosts the first "Dance for the Plants" fundraiser and it goes successfully. Professor Chris Hilgert, with funds from a USDA Specialty Crop Grant, starts the Apple Tree Project, and him and the intern team plant over 60 apple trees (a mix of dwarf, semi-dwarf, and standard sized trees). The CSA program has continued to grow over the past years, reaching 15 half shares and 5 full shares this year. This is partly thanks to a part-time AmeriCorps VISTA member serving for the farm for the first time this summer. The Summer High School Institute students continue to visit the farm as a part of their summer program. 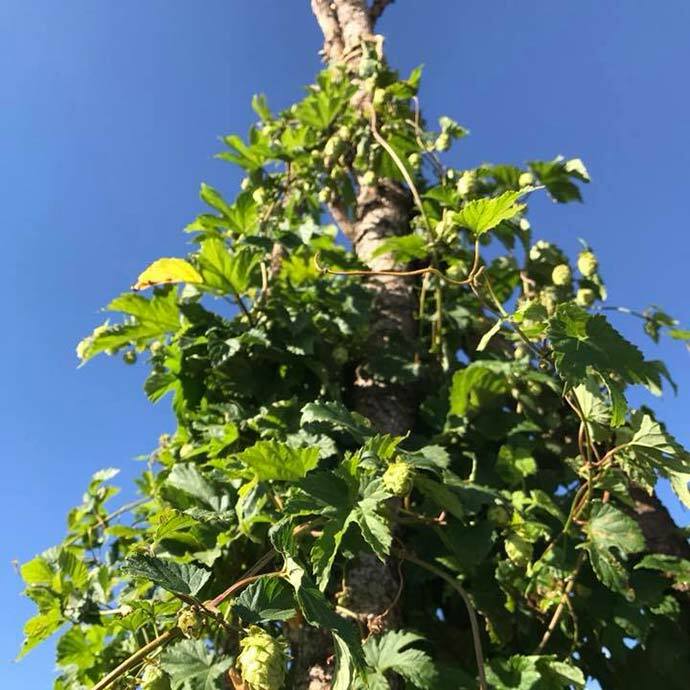 ACRES also receives a USDA Specialty Crop Grant for hops - a new project that will begin in 2018. ACRES receives a full-time AmeriCorps VISTA member to serve the organization for one year, as well as another part-time summer VISTA who serves as an additional farmhand. Thanks to the hard work of the interns, officers, and VISTAs the farm has seen an increase in retail sales to local breweries and resturaunts since last year. The second-annual "Dance for the Plants" fundraiser is successful in raising funds for the summer internship program again this year. The event is held at the Historic Laramie Railraod Depot and features local bands and beer donated from local breweries including Coal Creek Tap, Altitude Chophouse & Brewery, the Library, and Blacktooth Brewing Co. The interns begin planting hops for their USDA Specialty Crop Grant project under the direction of Urszula Norton, ACRES Faculty Advisor. Chris Hilgert continues to work on his Specialty Crop Grant apple variety study - only one out of sixty-three trees has died during their first winter at the farm!